Hair extensions instantly add length. Extensions add volume to hair. Hair extensions allow you to add a highlighted look in natural or vibrant colors without damaging your hair with harsh dyes and bleach. Extensions allow you to create more complicated hair styles and updos, making them a must for special occasions. Certainly, hair extensions are a great "secret weapon" to keep in your arsenal of hair tools. Plus, these adaptable hair pieces come in a variety of materials and can be applied and in numerous ways, so you can pick the hair extensions that work best for you. Human hair can be styled to perfectly blend with your natural hair to give a natural look. Human hair extensions can be dyed or permed by a professional to more closely match your natural hair. With proper care, human hair lasts longer than syntheric hair, with a lifespan of a year. Like your own hair, human hair extensions will become frizzy, and they need to be styled daily. Human hair is heavier than synthetic hair. Human hair extensions are the most expensive option. Heat Friendly synthetic hair can be styled with heat, allowing you to blend it with your natural hair for a more realistic look. Heat friendly synthetic hair is not affected by weather and willl not frizz. One it is styled with heat, heat friendly synthetic hair will hold its shape until heat-styled again. High quality options look and feel realistic. Heat friendly synthetic hair cannot be dyed or permed. This type of hair has a shorter lifespan of 3-5 months with proper care. Synthetic hair is weather-resistant, hold its style, and only requires minimal styling. High quality synthetic hair looks and feels very natural. Extensions made from synthetic hair cannot be styled with heat. This means they cannot be curled or straightened with your natural hair to give the most realistic look possible. Because of this, extentions are typically made with heat friendly synthetic hair rather than standard synthetic hair. Synthetic hair extensions have a shorter lifespan than human hair extensions at around 4-6 months. Synthetic hair cannot be dyed or permed. There are several ways to attach hair extensions to your natural hair. Some options are strictly temporary, and some are semi-permanent. Ketain glue is pre-applied on top of small bundles of hair. The glue on top of each bundle is then melted with a heat gun in rows near the root of the natural hair, fusing the hair bundles to your own hair. Lifespan: 2-6 months, depending on how quickly your hair grows and how well you take care of your extensions. This process consists of braiding tracks of hair extensions to a braid on your natural crown of hair using a needle and thread. A kind of tape that’s made specifically for hair is first pre-taped to wefts of hair extensions, then taped to the root of the hair. Small wefts of hair are attached to your own hair via a bead or "link." Your own hair is pulled through the link, which is then clamped down near the root. If you don't have enough natural length to pull off a bun or long braid, you can add a hair piece like a faux bun, braid, or ponytail. Clip-In hair extensions are wefts of either human or synthetic hair on a silicone or fabric base. They are attached to the hair via small, comb-like clips. Lifespan: 3 months-1 year depending on the type of hair and treatment of the extensions. You can put in Clip-In hair extensions by yourself and there is no need for professional retouching. Clip-In hair extensions are the least permanent hair extension option, allowing more versatility. They are easy and fast to apply, generally taking 30 minutes or less. They can last longer than other options with a lifespan of a year or longer if properly cared for. Clip-in hair extensions are affordable. Clip-in hair extensions do not use heat, chemicals, or pressure, so, with proper use, they will not cause damage to your hair. The next step is learning how to put on your clip-in hair extensions. There's a little bit of a learning curve, but if you follow our step-by-step guide, you'll get the hang of it in no time. Use your rat-tail comb to separate your hair into two sections. Remember that you don’t want your clips to show, so you must leave out enough hair on top of the head to cover the tops of the extensions. Use a claw hair clip to hold the top section of your hair in place. Use your comb to separate the rest of your into the same number of wefts you have. For example, if I have 10 wefts, I will separate my hair into 10 sections. If there is only one weft, the hair does not need to be sectioned off. Select the weft of hair that will achieve the length that you want for that section, and position the weft’s clip new the root of your hair. Clip down, then gently tug on the weft to make sure it’s securely attached to your head. Repeat until you have applied all of your extensions. Blend your extensions and natural hair. If you have human or heat friendly synthetic hair extensions, take sections of your natural hair and your extensions together, and curl or straighten the sections. If you have synthetic hair extensions that are not heat friendly or do not want to use heat, twist or tousle the hair together to give a more natural appearance. As mentioned styling your extensions with your natural hair using a curling iron gives a more seamless, natural looking appearance. Take your extensions to a professional. They will be able to trim and layer your extensions and your own hair to create a unified style that blends together perfectly. For the most natural look, select a color that is similar to your own hair color. Typically, extensions that are up to 2 shades lighter or darker than your own hair will give a natural look. You can also dye your hair to better match your extensions, or, if you have human hair extensions, they can often be dyed or highlighted to blend better with your own hair. Make sure that you take your human hair extensions to a professional to be dyed, and note that dying extensions can potentially shorten their lifespan. For more information on selecting the correct hair color, click here. For instance, if you have thin hair, select extensions that are on the thinner side, such as these invisible crown extensions. If you have thicker hair, select thicker extensions. This will give the most natural look possible. Now that you know how to put in clip-in hair extensions, we have some tips to help you care for them. With proper care, your extensions will look better and last longer. 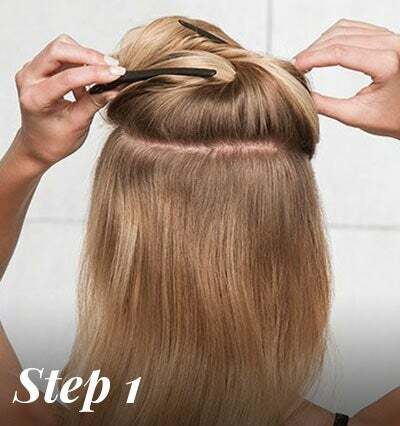 Step One: Remove all tangles from your hair extensions. Step Two: Soak the extensions under lukewarm running water, or in a basin, tub or sink full of water until they are fully saturated. Step Three: Gently massage shampoo into each weft of hair from top to bottom, combing through with your fingers to avoid tangles. Step Four: Rinse the shampoo out of your extensions under running water, or in a basin of clean water. Step Five: Gently massage conditioner into the hair from top to bottom, combing through with your fingers to avoid tangles. Allow the hair to absorb the conditioner for several minutes. Step Six: Rinse your hair extensions under cool running water, taking care to remove all residue. Step Seven: Squeeze the excess water out of each weft with your hands. Step Eight: Use a wide tooth comb to gently remove all tangles. Step Nine: Lay out each weft flat on a towel and allow them to air dry in a place away from sunlight. How often should I wash my clip in extensions? You should wash your clip in hair extensions once every 4-6 weeks. Hair extensions should not be washed everyday, and washing them too often will actually damage the hair and shorten its lifespan. Instead, hair extensions should not be washed more than once a month with regular wear. How do I dry my clip-in hair extensions? Avoid blow drying your extensions. Like your own hair, heat can be damaging to hair extentions. To make sure your hair extensions stay beautiful, avoid using heat when you can and allow your extentions to air dry. Gently remove any tangles from the wet extensions with a wide tooth comb, lay them out flat on a clean towel, and allow them to dry naturally. You should squeeze out excess water with your hands over the sink before laying the extensions on the towel, but make sure you do not wring out the extensions, or rub them with the towel. How do I brush my clip-in hair extensions? You should brush your clip-in hair extensions before you put them on and after you take them out by holding each weft at the top and gently brushing from the bottom up, just as you would brush your own hair. Use a brush with gentle bristles, such a wig brush, or a wide tooth comb. You should never brush your extensions while they are wet, as this will cause the hair to stretch and tear, creating tangles and slit ends. However, it is alright to very gently comb through your extentions with a wide tooth comb before setting them out to air dry to avoid tangles. What products can I use on my clip-in hair extensions? Use gentle products on your clip-in hair extensions. If you have synthetic hair extensions, you should always use products that are specifically designed for synthetic hair. For both synthetic hair and human hair, using products designed for wigs will help extend the lifespan of your extensions. You should also apply a heat protectant to your extensions before using heated styling tools. Can I sleep in my clip-in hair extensions? Always store your hair extensions at night, and never sleep in your hair extentions. Sleeping in your clip-in hair extensions can cause them to mat together with your natural hair, damaging both your own hair and your extensions. When you’re not wearing your clip-in hair extensions, it’s important that you store them properly. There are two basic ways to store your extensions. 1. Store your extensions in a box. Once you remove your extensions and make sure they are free of tangles, you can carefully place the wefts in their original packaging, or a shoe box to keep them safe. You can safely store your extensions on a hanger with clips by clipping the hanger to the wefted part of the extensions. This is great for easy, fast access. If you have just washed your extensions, make sure they are completely dry before you store them to prevent mildew. Make sure to store your extensions away from direct sunlight to avoid color fading. If you want long, beautiful, voluminous hair in a matter of minutes, extensions are a great option. Now that you know the in's and out's of hair extensions, why not give them a try? You can view our full selection of hair extensions here!